Right click anywhere in the Project Tab and select Repair Input Manager. 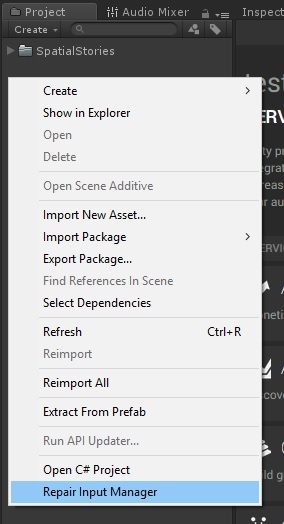 Once you have converted your Unity camera into an Interactive Camera (IO) (see this section for more details), hit play. The system will check if you have the necessary configuration in order to use the input system. If you don’t have the proper inputs setup, you will be asked to configure it. Just click on Solve It Automatically. Note that your original InputManager file will be kept as a backup in the same location.